The Stripe integration will enable you to take customer payments through your dashboard calendar, plus you'll have the option to allow customers to make payments through your online Booking Page. This integration also links payment data with appointment histories, making it easier to track business transactions. You will need Setmore Premium and a Stripe account to set up this integration. Click here to check if Stripe is an operational payment gateway in your country. Also note that Stripe charges a small percentage fee per transaction. Click here for more information. Log into Setmore at https://my.setmore.com and navigate to Settings > Payments > Stripe. Click the "Activate Stripe" button. You will now be prompted to sign in with your Stripe account to grant authorization for Setmore. Once you sign in, the integration will be activated and you can start taking payments. 1. From your Setmore calendar, click on the appointment for which you want to process a payment. In the popup window that appears next to the appointment, click the "Edit Appointment" link in the bottom left. 2. 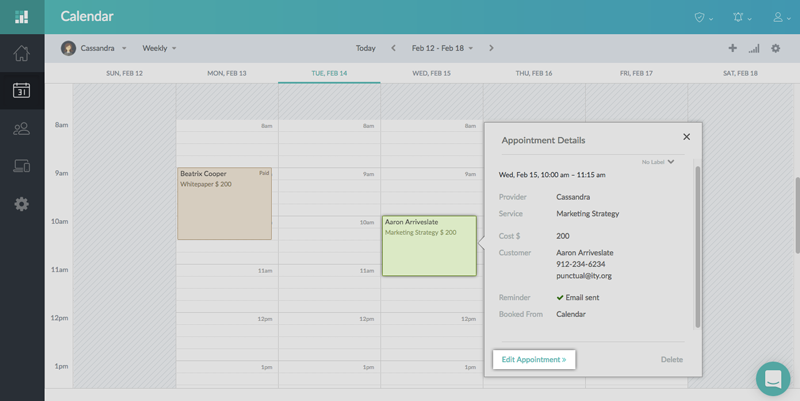 In the Appointment Details menu, click the "Pay Now" button at the bottom of the frame. 3. For Type, click the radio button for "Card" and proceed to enter the customer's payment card information. When everything looks good, click the "Charge Customer" button. You will receive a Payment Confirmed message if the transaction is approved. Navigate to Settings (gear icon in left menu) > Payments > Configure, and select the Stripe card from the list of payment providers. In the Stripe Integration menu, click the "Deactivate Stripe" button, and click "Deactivate" again to confirm the action. The integration will now be deactivated.